Mere Noise Records » Texas Tea – Final Oz Show for 2013 – Off to Europe. Texas Tea – Final Oz Show for 2013 – Off to Europe. 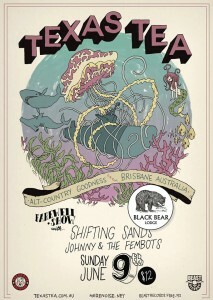 Texas Tea are off on one of their fantastical journey’s to Europe in July but before they do they are playing one last show… which will also be their last Oz show for 2013!!! It is a public holiday the next day. There will be beer and wine. There will be songs. Sounds to us like there is no reason to miss this! Supports from Shifting Sands + Johnny & The Fembots!